Smile Center Silicon Valley - Cosmetic Dentists San Jose: What are dental implants and why does one need them? What are dental implants and why does one need them? Most people visit the dentist only when they have a problem. Usually, the appointment is made when the problem gets severe. Dentists recommend dental visits at least twice or thrice a year for cleaning, and a general check up to ensure that you don’t get dental problems. Some of the dental problems that you might get if you do not visit a dentist regularly are cavities, bleeding gums, toothache, etc. 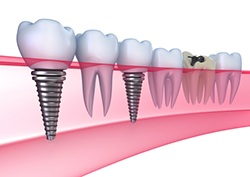 Dental implants are usually made of titanium. The implant is fixed in the cavity where the missing tooth was, deep enough to reach the root and are fixed to the mandible, the bone that is inside the gum. An incision is made into the gums till the bone is visible. Then the implant is inserted into the incision to ensure that it touches the bone. Then the gums are stitched up and allowed to heal. The healing process could take a couple of months since it is important that the dental implant is not dislodged. The dentist will prescribe a diet of soft foods to make sure that the implant does not move while eating. It is a critical period till the dental implant is firmly fixed. The doctor’s orders will have to be followed implicitly, till the dentist is absolutely sure that the implant was a success. If a patient with a cavity visits a dentist, the first thing that the dentist and quite often a periodontist will do, is to examine the cavity. The first course of action will be to see if they can find a way to heal the infection, and prevent loss of tooth, by cleaning out the cavity and filling it with enamel. If the patient has come in time, it is possible to save the tooth and not have to go through a dental implant. If the tooth infection has progressed to a severe level and the only course of action is the removal of the tooth, the dentist will check if there is enough bone density in the area to support the implant. If there isn’t, the dentist may have to do a bone graft before proceeding with the implant. Dental implants are a permanent solution and therefore a better option than dentures. They look and feel like your natural teeth and you probably will look better and feel better with these prosthetic teeth. Unlike bridges which may cause a secondary infection and may adversely affect the teeth and gums in the surrounding areas, a good tooth implant will ensure prevention of infection. Of course as a dentist would tell you that prevention is better than cure, so do visit your dentist regularly and keep cavities at bay.